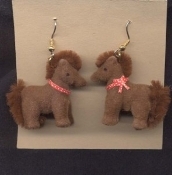 HUGE Funky FUZZY PONY EARRINGS - My Little Toy Horse Stable Costume Jewelry - BROWN Body with matching Mane and Tail. Big Flocked plastic mini figure toy charm, Approx. 1.25-inch (3.13cm) diameter. For equestrian lovers and cartoon character collectors alike!